I love Mexican! But not the calories that come with a ton of the cheesy dishes so now we do our Mexican at home. I had stuffed peppers for the first time from my friend Dani-- as they're usually done with beef in the Mexican restaurants- and I was sold. And the filling makes lots too so you can have multiple meals in the days to follow. It's a bit of chopping and dicing but so, so worth it. Cheese, cilantro and onions to sprinkle on top. 2- Saute onion and garlic and then add all the veggies. Mix in beans, corn, cilantro, cumin, diced tomatoes and salsa and keep on medium until veggies are cooked. Add cheese. 3- In a separate pot, brown turkey in 2 tablespoons of canola oil. Mix into veggie mixture slowly. Add salt to taste. 4- De-seed and de-vein all peppers-- this makes a huge batch maybe like 8-10 peppers worth (times two as you halve the peppers). In a half inch of water in a flat dish, place peppers face down and microwave for two minutes. 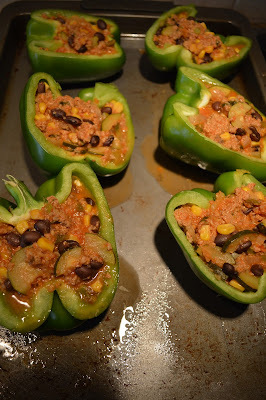 5- Stuff peppers and place in an oven with temp of 350 for twenty minutes. Remove from oven and add cheese. Return to oven for 5 to 10 minutes again. Top with green onion, cilantro and sour cream if you wish. There you go…. This is one of my favourite dishes. So yummy…. Light but hearty at the same time! We get our veggies in but with the sprinkling of cheese, quinoa and the ground turkey, it's really filling too. The kids just eat a big bowl of the filling as they're not a fan of the cooked peppers but that's just quinoa, turkey, beans and veggies so that works too!! Yum!!! I bet this filling freezes well! I'll have to put it on next month's menu! I don't make stuffed peppers that often but this recipe looks tasty! The kids and I are not big fans of quinoa, but I could substitute rice. Great use of quinoa and zucchini. Healthy and delicious. These look so fantastic! YUM! That's funny we both shared stuffed peppers recipes today. Yours look so good and I like that you used quinoa. I LOVE stuffed peppers!!! I make them at least once a month but have never added zucchini! Will be trying that out!